Papaya is a soft skinned fruit, a staple on breakfast tables in Hawaii for its nutritional value, softness and delicate sweetness. Fruit is ripe when the green fades out into orange and body softens. 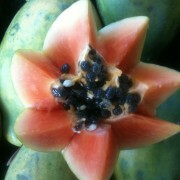 Traditional varieties of Hawaii grown papaya are: Kapoho and Solo (yellow fleshed) and Sunrise (red fleshed). The “Rainbow” is a genetically engineered cultivar that was developed by University of Hawaii to resist Ring Spot Virus. Papayas are contain more vitamin C than oranges and are also a good source of vitamin A. Because of its papain content it is also thought to aid digestion. – Traditional varieties of Hawaii grown papaya are usually eaten ripe without seeds or skin and usually consumed fresh at room temperature or chilled. – They can also be used to make smoothies, juices, preserves and desserts. – They can also be dried and eaten like fruit leather. – Unripe green papayas are often used in Asian cuisine marinated and fresh shredded in salads, cooked in soups and curries. Farmers at the farmers markets bring papaya at a variety of stages of ripeness, they know that their customers are shopping for papayas to eat tomorrow and slowly, perfectly ripen as the week goes on. Yes, papayas are one of the of fruits that can actually ripen after it is picked. To ripen, keep papays in a cool place, out of direct sunlight and safe from accidental contact with water. Most papayas are ripe when the percentage of yellow surpasses the green. Select papayas free from bruises unless you are going to eat immediately. Once cut, store leftover papaya in the refrigerator in air tight container or cover with plastic. Like most fruit it can also be frozen, just cut into ready to eat pieces and store in air tight container or bag. Will last up to six months in freezer.